As Yesterday we have came back with another movie voucher loot…. Yes its a 100% cashback loot.. Enjoy Watching movies… THen Here U go.. Important Note- This sale will start on 7th April, from 3 pm and only 2500 vouchers will be available for sale. So just be as fast as you can. 3. Now select your city. 4. 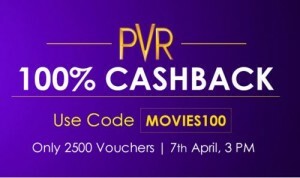 Now click on top left button –> Promo Code –>Enter code –> MOVIES100 on 7th April at 3 PM. 5. Now visit the “Movies” Category. 6. Purchase a PVR movie voucher and make the payment. 7. On payment confirmation, you will receive your voucher details via SMS & email. 1. The offer is open from 3 pm onwards. 2. Only one voucher per person, per transaction is permissible. 3. Only 2500 vouchers are available for sale. Offer valid till stocks last.